Pioneer Press: "I don't think I've ever had an ovation quite like that," said Capps, who ran out to the same song he did in D.C. ("The Final Countdown"). "It gave me some goose bumps coming in. It feels good when people appreciate what you've done. To come here on Day One and get an ovation like that, I mean, what a feeling." Can the Twins play the Royals/Orioles everyday? Okay, maybe not technically but it sure feels like it. Over the past 7 days on the road, the Twins have outscored their opponents 60-16! The highest point of the trip was on Monday, when the Twins all padded their stats by beating the Royals 19-1! That score deficit apparently tied the Royals’ worst loss ever—but one poster on the Kansas City Star website made a pretty strong argument as to why it was actually the worst Royals’ loss ever. See? Finding the positives! No temper-tantrums! So kudos to Royals Fans! The Twins have had the second highest T.V. ratings out of all MLB teams so far this year. Despite also being Canadian, it looks like Morneau isn’t going to be the next Corey Koskie. He saw a concussion specialist last week who said he is making progress and by the end of the week he was working out at Target Field. Great News: Delmon Young shows no signs of ending the “Proving Jim Souhan is an Idiot Campaign of 2010” anytime soon. Superstar Twins blogger Nick Nelson hypothesized in a blog post last week that Joe Mauer's performance has suffered this year because he's been playing through several nagging injuries. Others have been saying the same thing. Turns out, they were spot on. 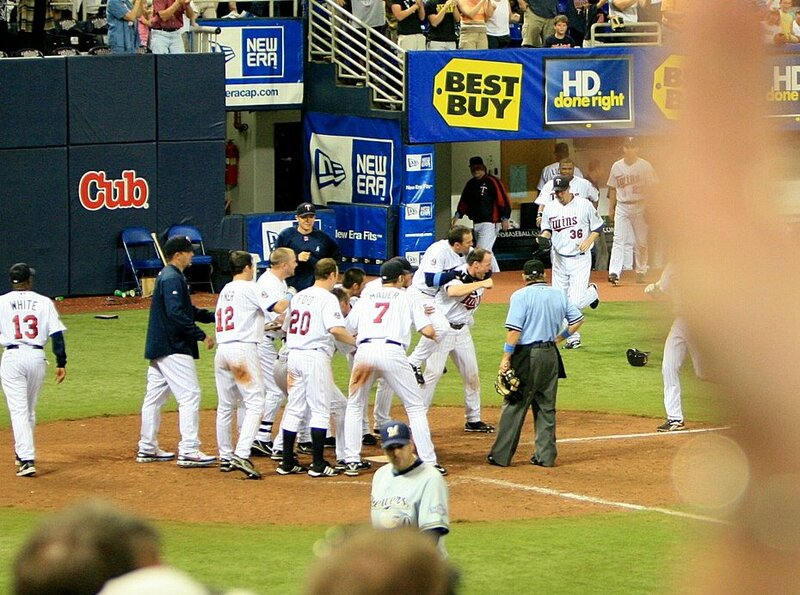 So during the 8th inning of Pavano's complete game shut out last night, a Baltimore fan ran onto the field. I don’t have cable, but I am assuming as per the norm they did not show the fan on TV. I don’t support fans on the field—but honestly, somewhere deep down inside, you're kinda cheering for these idiots. On the radio last night, John Gordon made this particular incident sound pretty epic ("Oh wow, this is ridiculous! Looks like they have him trapped.... oh no! My goodness!! He jumped back into the stands…. That is one of the longest delays I have seen for a fan on the field in quite some time."). WHAT KIND OF FAN ON THE FIELD WAS THAT?!? The kid wasn’t even running! The police weren’t even running! It dragged on until the kid just stopped and pretty much said “ok, I’m done.” What the heck!?! Apparently, the Orioles have a no-chase policy. Yeah. The “no effort” approach. I understand how this no-chase policy could work. But I’d really rather see that idiot tackled a la the famous Boston batboy fan on the field tackle of 2006. While listening to this fan on the field business last night, I realized that I have yet to see any fans on the field at Target Field. This isn’t a bad thing, but it is a little odd considering this used to happen quite frequently at the Metrodome. Not as frequently as wedding proposals on the jumbotron, but frequently in a similar “oh my god this would be more exciting if this was the only game I came to” type way. Why no fans on the field at Target Field? Probably because many of the seats are raised up further off the field than at the Dome, and there’s that moat that separates most fans from the seats where one could easily jump onto the field. It could also be because one of the consequences of running onto the field is that you are kicked out of the stadium for life. Oh, and you’re arrested and fined thousands of dollars. I only know this through word of mouth, but if you don’t believe me you are free to test it out yourself. So basically, if you wanted to be smart about it, you'd have to run onto the field in the bottom of the 9th inning during the stadium's last game ever. Man, if he had gotten over that fence that would have been so epic. Moral of the story: Fans on the field can be annoying. No-chase policies that allow fans to jog around the field for several minutes can be even more annoying. And I prefer wrestling holds over tasers. Thanks. Mike Redmond: "They should bring me back just to hang out." Former Twins catcher Mike Redmond, released by Cleveland, kidding, on the Twins: "They should bring me back just to hang out." Yes! Please! Can Mike Redmond come hang out? Just imagine: More naked batting practice. More smelling ‘em RBIs. More piggyback rides for Punto. Morneau lamented to an FSN reporter a couple weeks ago about how much he missed Redmond, and felt it was affecting the team. "Not having (Mike) Redmond here has made a difference in the dugout," He said. "He didn't play every day, but he was involved every day. He was in there, yelling and just having fun. Keeping you loose in the dugout. "Being positive is the most important thing. Sometimes this game can beat you up, it's so negative." See? Isn't that more fun than just complaining about Nick Blackburn? 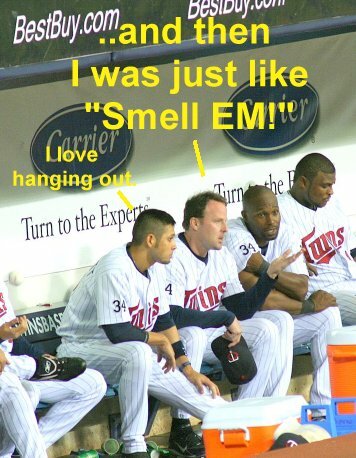 The Twins have good players, those players just need a spark. So what do you say Twins? Can Redmond come back? Just to hang out? Never in my life did I think I'd be sad to see this man pass. But alas—he was a baseball legend. I was inspired to draw a picture. I tried to make it as realistic as possible. …to cheer on the Saint Paul Saints. After Sunday’s Twins’ game, I flipped channels until I came to a Saint Paul Saints’ game during a rain delay. Lots of videos detailing Saint Paul Saints history, Kevin Millar love, etc. It went on for about an hour. Then the game started back up, and the Saints were losing 2-13 in the top of the 9th. …to watch Jacque Jones pop out? Picture Courtesy of My Mom! 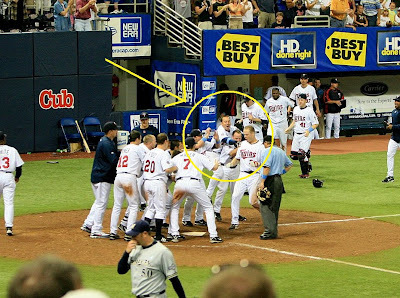 Cuddyer, Terry Tiffee, Red Dog, Gardy, Varitek? 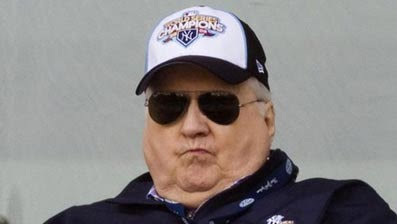 …to realize the American League's All-Star game winning-streak is over. Cliff Lee to Twins! Er, Yankees! Reds? No wait—Rangers! Isn’t this FUN? Aren’t you just on Google News searching for “Cliff Lee” every other minute? July 7, 10:40am: Joel Sherman (NYPost): "[T]he perception in baseball is that Minnesota is the frontrunner for Lee. " July 8, 8:12am: Cliff Lee to Twins? July 9, 9:30am: Are the Yankees About to Get Cliff Lee? 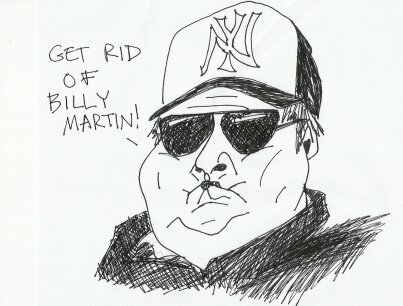 July 9, 11:32am: What if Yankees get Lee? Don't you feel informed now? MLB.com is finally calling it! VOTE FOR DELMON YOUNG TO BECOME THE FINAL MEMBER OF THE 2010 AMERICAN LEAGUE ALL-STAR TEAM! HE LOST 30LBS IN THE OFFSEASON! July 4th was a big day in Twins Territory—Target Field’s first Bobblehead Day. If you never went to a bobblehead day at the Metrodome, this is typically how it went: a few crazy fanatics would get in line the night before, pitching their tent outside one of the gates and such. All the sane people would show up the next day, one to three hours before the gates opened. The gates opened two hours before the game, everyone filed in, got their dolls—then immediately turned around, got their ticket signed, and left the game. Fans were allowed to re-enter later with the signed tickets. Some fans came back, many didn’t. At Target Field, however, things are different—there is no re-entry. This was announced in the Target Field Fan Guide, on the Twins’ Website, and also in an AP story carried by the Pioneer Press, WCCO, and USAToday. Apparently, however, some people live under a rock, because when I checked Facebook later a fan who runs a Target Field page was complaining about the different re-entry policy. “Fans were trapped rats at 11 AM” the guy wrote in his status. The horror! 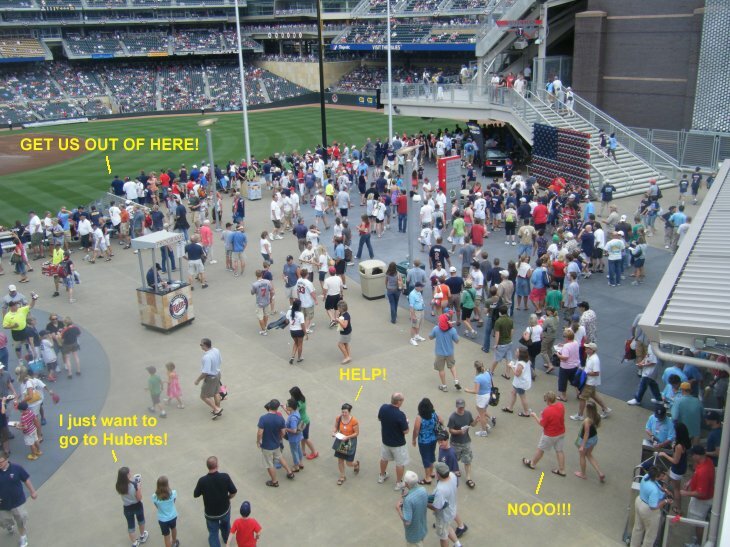 Twins fans “trapped” in Target Field for two hours on a beautiful day! One person who responded to the comment said she had never even been to Target Field before—and she was raging over the no re-entry policy! I really do not know how someone could go out of their way to specifically get tickets for bobblehead day and plan to be there early without hearing about the re-entry policy, or at least looking into it. I became aware of this policy change before the season even started. It's not like no one knew about it. Not to mention, ushers were outside warning people in line that there was no re-entry. The change in policy makes perfectly good sense--unlike at the Dome, it would be way too easy for fans in Target Field to slip their re-entry tickets to ticketless fans outside the park. Steel bars are all that separate the park from the street in a lot of areas, plus there are all those patios on (or hanging over) the sidewalk outside. Just think about it. Spending two hours at Target Field before the game starts really isn’t that bad. If you’re worried about spending too much money on food while there, bring your own food (but remember—projectiles such as apples must be sliced). If you're hot, go into air-conditioned Hrbek's, Town Ball Tavern, or another area. If you're bored, go to the game station behind center field and play video games. If you don’t want to carry your bobblehead with you around the park, bring a bag to carry it in. If you don’t have enough forethought to bring a bag, sign up for that Treasure Island thing in left field and get a free Twins bag at the game. If you find something else to complain about, just don't even bother coming in the first place. Seriously. If you’re a Twins fan and call yourself a “trapped rat” because you have to spend two hours in Target Field with a bobblehead, there is no helping you. Anyway--welcome to the family, Minnie and Paul. There have been many things to look forward to this season, and there was one I was looking forward to particularly: seeing Thome hit his 573rd and 574th homerun to tie and pass Harmon Killebrew for 10th place on the all-time homerun list. Of course, out of all the games I have attended this season, and even just in the past week—Thome waits and hits both 573 AND 574 on Saturday when I was not at the game. I know, I know, cry me a river. But they did replay Harmon’s video congratulations video and have Thome do another curtain call before the game on Sunday. Congratulations Thome! It's so great to finally see you in a Twins uniform! After the critter stuck around for a few minutes, we named him Corey Koskie. Corey Koskie ended up sitting on my head for almost the entire game. I even went to go to the bathroom and Corey Koskie WAS STILL ON MY HEAD! The people sitting behind me were pretty amazed with Corey Koskie as well. Thankfully, they saved me by gently re-directing Corey Koskie in the 7thn inning when he started trying to climb into my ear. In the 9th inning, my Mom suddenly noticed that Corey was gone. I figured he had flown away. 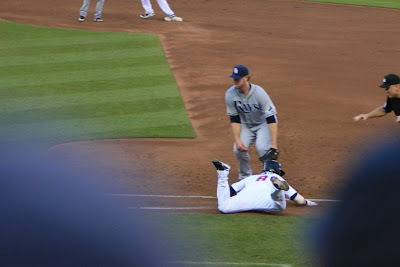 When we were leaving, however, I looked down at the ground behind my seat and saw Corey Koskie lying on the ground twitching! My Mom and I tried to make him comfortable. We figured it was post concussion syndrome and there wasn’t much we could do about it. We left him on top of a piece of newspaper. Friday’s game was exciting, because (a) the Twins actually won, and (b) there were the first ever post-game fireworks at Target Field! So the fireworks were actually sort of lame. My favorite part was just seeing all the light turned off at Target Field. That's pretty much as exciting as it got. It probably looks better on video. The players and their families watched the fireworks from the field. 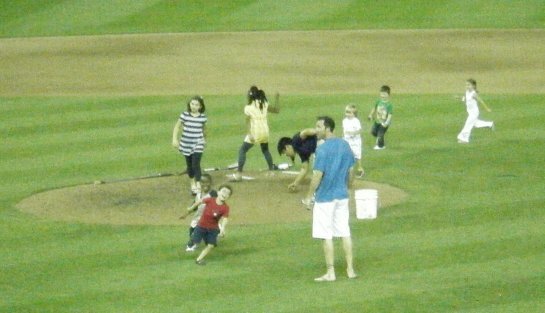 Joe Nathan, now apparently regulated to team babysitter, could be seen chasing a bunch of kids around. If anyone from the Twins organization is reading this, here’s my suggestion: instead of only lighting fireworks from the top of the parking ramp behind right field, light off fireworks from a few of the different parking ramps surrounding the field! Heck, get some lasers or something too. It's a Glen Perkins street flag! Beiber craziness at Target Center. Pavano craziness at Target Field. That, my friends, is called grit.